Renewable means that the energy won’t run out, unlike coal, oil and gas which will. Before we get started on renewable energies let's take a look at non-renewable energy. Natural radioactivity was discovered in the year 1896. From this came the idea of “splitting the atom” or fission. This involves breaking up large atoms of a mineral called uranium to release their energy. Uranium is a naturally occurring material which was left over from the earth’s formation. 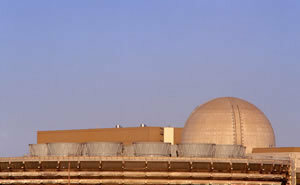 Nuclear power does not produce any greenhouse gases which is a great advantage with the current climate change crisis. 2015 statistics show that nuclear power represents 11% of the world’s production. Many world leaders believe that this is the way forward, especially as they are under pressure to reduce the amount of pollution they produce in accordance with the Kyoto Protocol which came into force in 2005 and with agreements made at the 2007 Bali Climate Change Conference to reduce emissions even more. The world’s first nuclear power station was built in Cumbria, England in 1956. As of 30 June 2015, 18% of the UK's electricity is being produced by nuclear power. This is likely to be reduced to only 4% by 2030 since most stations can only last about 20 - 25 years before they become inefficient or are considered unsafe. About 2/3 of the radioactivity to which we are exposed is natural. When it is made artificially it can be used for medical purposes, in archaeology to date relics and in industry to conserve food. Fission is when we split an atom artificially by bombarding it with neutrons. We have to use uranium for this because it is an element which is “fissile” or unstable - we can break its nucleus in two by adding an extra neutron. This reaction creates a lot of heat and radiation - its the heat which we can use to make power. But it also releases more neutrons which will go and bombard other atoms to create more energy, and more neutrons and so on. It's a chain reaction so we can get a lot of energy from it. That’s why the place where nuclear energy is made is called a nuclear reactor. Inside a nuclear reactor the heat created by splitting an atom is used to heat water just like in coal power stations. The steam from the hot water is forced through turbines and their movement is used to generate electricity. The power it releases is huge. A lump of uranium releases 2 million times more power than a lump of coal the same size. The electricity produced does not need to be too expensive because its so efficient. But nuclear energy is a controversial subject. There are many good things about it, but potentially it could cause major problems and many people are afraid of this. Fission does not just create heat but also radioactive waste. Nuclear fission is highly explosive and can even be used to make bombs. Accidents are a major concern such as in 1986 when a nuclear reactor exploded in Chernobyl, Ukraine. Also, in 2011 the tragic explosion at a nuclear facility in Japan caused by an earthquake. This shows us what can happen when nuclear power stations are not constructed or maintained properly, or if natural and unpredictable disasters take place. The nuclear reactor is sealed inside a concrete and steel case to stop any radioactive gases form escaping. If it is looked after properly then coal powered plants can release more radioactivity. Mining uranium in the first place is not very clean. Then once the nuclear reaction has taken place, what’s left over is a lot radioactive waste which has to be disposed of somewhere very safe. This has to be somewhere where it can stay for thousands of years because that is how long it needs before it is safe to be near to it. At the moment nuclear waste is buried in the sea inside sealed glass cases. Transportation is also a risky business because if there was an accident the nuclear material could leak. If not handled properly radioactive waste can cause cancer and other health problems. Some people think it is just not worth the risk. What would be even better would be if we could master fusion. Instead of splitting an atom, this is the joining of two small hydrogen atoms into one helium atom. It’s not dangerous, but unfortunately at the moment we don’t know how to do it! One other thing, it is estimated that uranium will only last about another 60 - 100 years. That is why we need to look back to harnessing the power of nature.